Our current bells were installed in 1889. These eight bells, named after some of the Apostles, are made for change ringing, where they are swung through an arc to make a full and rich sound. Instead, they were permanently fixed with clappers and struck to chime. In this special heritage project, plans are underway to restore and convert these bells for change ringing by 2019. Work on the bells and preparation of the bell ringing chamber are estimated to take nine months, and cost $600,000. A further four bells can also be added to the existing eight if funds are available. More information about the history of the Cathedral Bells can be found in the brochure available here. 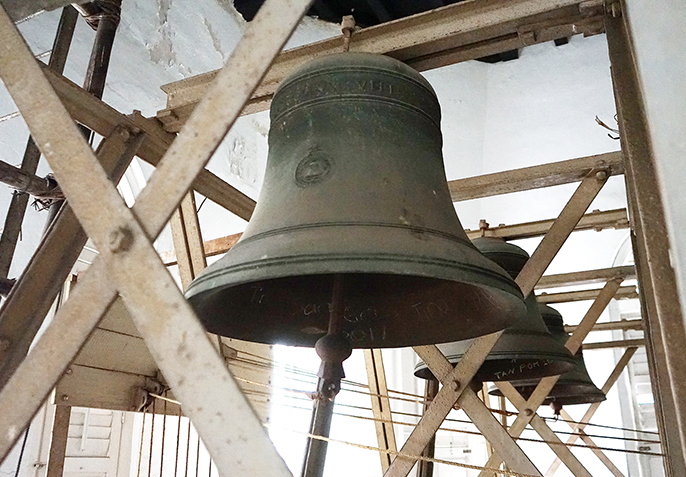 An in-depth article from our Courier Magazine can be read here about the history of our bells. If you would like to find out more, please contact Vivien Chen at vivienchen@cathedral.org.sg or call us at 6337 6104 ext 169.